Are you seeking a time to learn, grown, relax and fellowship? The Minnesota Christian Ashram is set for August 11th-14th, 2011 at St. John’s University in Collegeville, MN. There will be a wide variety of teaching times, prayer groups, fellowship, singing and free time activities available! 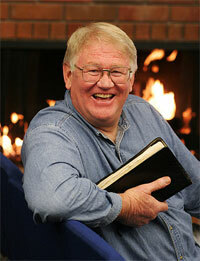 Evangelist – John McFarland: John McFarland is the pastor of Fountain Valley United Methodist Church in California. He also finds time to be an active police and fire chaplain in Fountain Valley. He and his wife, Kathleen, have five children, Ted, Mikaela, Kendall, Forest and Chad. John is known for his enthusiastic style of preaching, combining humor and depth in the Biblical call to discipleship in Jesus Christ. He inspires and educates youth as well as adults and believes the hope for renewal will come in regaining confidence in the Bible as the Word of God. Bible Teacher – TBD: As soon as a Bible Teacher is scheduled, we’ll include their biography here as well. Youth Ministry – Dee Vercruysee, Eric & Alissa Canfield: Dee Vercruysee has a passion for working with young people having spent 28 years in Christian youth work. She worked in the police force for five years and has been a human resource manager for the last several years. Dee loves being a part of the Minnesota Christian Ashram and has been involved with the youth for approximately sixteen years. Eric and Alissa Canfield have been youth leaders at the Ashram for 19 years. They have been married for 20 years and have three children, Lacy, Jackson, and Lily. Eric has been in real estate for 20 years and owns and operates his own company. Alissa works with him as Director of Design. They have a deep commitment to encourage youth to grow in the knowledge of Jesus through the Word of God and prayer to walk in his way. Children’s Ministry – Karen Martin: Karen has been with us for 18 years. Her Children’s Ministry is an exciting feature in the Minnesota Christian Ashram. She has had 30 years of experience working with all ages of children in the area of music, drama and creative projects. Karen and her husband, Ben, have three children, Rachel, Elizabeth and David.